Chairman of the Private Sector Commission, Eddie Boyer. 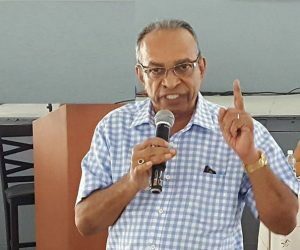 The Private Sector Commission and the Guyana government on Saturday continued to be at loggerheads over the business community’s ‘no confidence’ in managing the country’s economy as well as concerns about the constitutionality of a proposed law to recover stolen state assets, and alleged political interference in the judiciary. A day after government labelled the PSC a “political stool pigeon” and accused that organisation of one that “yields to its political handlers,” PSC Chairman Eddie Boyer rubbished claims that the private sector was demonstrating political bias. “If the economy is not doing well, we must not speak out? This is a free country. They can deem me political or the Private Sector Commission but that is not message. The message is there: people’s businesses are suffering,” he told Demerara Waves Online News. The Guyana government slammed the PSC, accusing the body of parroting the opposition People’s Progressive Party’s (PPP) position. “The Government of Guyana deems it rather shameful that the PSC has allowed itself to be used as a political stool pigeon to repeat the propagandistic chatter of the opposition and to seek to undermine confidence in our economy and good governance. Despite the harsh exchange of words between the two sides, the PSC Chairman does not believe this will lead to a breakdown in communication. “I think the government needs to listen to the private sector and work with us and have more communication and dialogue so we could fix the economy,” Boyer said. A number of large business owners, who are strong supporters of the APNU+AFC coalition have been also complaining bitterly about the economic downturn due to taxes, a protracted foreign exchange shortage and general slowdown in commercial activity. Lashing back, the PSC expressed surprise and disappointment that the government which was elected to serve the people of Guyana, resorted to pejorative terms and at the same time failed to respond to concerns that have been raised by the business sector. “The Private Sector Commission is also alarmed at the fact that the entire missive, purportedly emanating from the Government of Guyana, addresses none of the points raised in the Commission’s statement and does not attempt to answer the perception of the business community that the economy is on the decline; a perception that should be easily refuted by the Government were it not evident by the economic data which the Government itself disseminates,” the PSC said in a statement. The umbrella business grouping said it is a democratic organisation that represents close to five thousand micro, small, medium and large businesses through their membership of the 24 sectoral member organisations which each have a seat on the governing Council of the Commission. “These persons all have diverse political views which span the spectrum and the Private Sector Commission respects all of these views.The Government’s statement that it has “full respect for business” is made a travesty by the entire content and tone of its missive,” the PSC added. Boyer said it almost two years now and the PSC has been unable to meet with President David Granger to discuss issues facing the economy. And, the PSC said it had hoped that government would have seized the opportunity of reaching out for talks on the range of concerns. “The right and proper path for the Government to follow if it is perturbed by the expressed views of the business community is to engage the Commission in constructive dialogue aimed at resolving the highlighted problems, especially in view of the healthy relationship which the Commission and the Government have enjoyed since its assumption of office,” said the PSC. The PSC says it is concerned that the sluggish economy is leading to capital flight and increased property inventory at low prices. Other concerns are about the State Assets Recovery Agency Bill that the PSC says is unconstitutional and should be dispatched to a bipartisan select committee. The PSC fears that the Bill can be used for political harassment. However, government has signaled that the Bill will be debated and passed at the next sitting instead of taken to a select committee. The PSC is also worried about political interference in the judiciary, weeks after Attorney General Basil Williams had expressed concern about the role of the Chancellor of the Judiciary, Carl Singh in appointing magistrates and judges. President Granger is yet to accept a recommendation by the Judicial Services Commission to appoint several judges.